I have to admit to being rather disappointed with this book, which I had really been looking forward to reading. It probably doesn’t help that Birdsong by the same author is my favourite book ever so this had a lot to live up to. I really didn’t like the protagonist, Dr Robert Hendriks. I found him to be rather cold with a strange, rather arrogant, attitude towards women. It wasn’t until half way through the book when the love interest Luisa was introduced that I started to engage with the story. I found the sections on psychiatry to be rather dry and thought they didn’t add to the story. In fact, I skimmed over parts of these and don’t feel I missed out on anything important. There was some rather strange language used, words I had no idea what they meant and thought rather self-indulgent: palimpsest and chiaroscuro to mention a couple. Perhaps this just shows my own vocabulary is lacking! But there were sections of the book I enjoyed. The part of the book set in Italy when Robert met Luisa was beautifully written and writing about love is something I feel this author does very well. What Robert found out about his father’s time in the First World War and the way it was presented was very moving. Overall, a book I had mixed feelings about. I don’t think it’s one of his best though it has flashes of brilliance but overall, I found it disappointing. 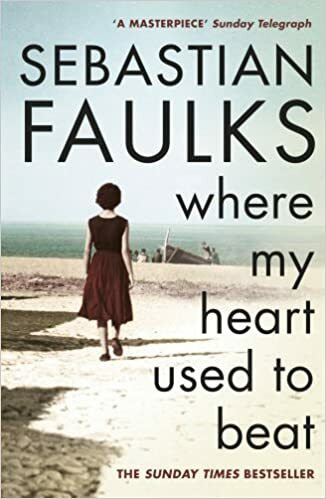 Looking at other reviews, many people have loved this book so if you are a fan of Sebastian Faulks, I’d say give it a go. It’s certainly not a bad book, just not my favourite. And if you have already read it, let me know what you thought. Where My Heart Used to Beat was published in paperback by Vintage on 30th June 2016. You can order a copy online by clicking here. On a small island off the south coast of France, Robert Hendricks – an English doctor who has seen the best and the worst the twentieth century had to offer – is forced to confront the events that made up his life. His host is Alexander Pereira, a man who seems to know more about his guest than Hendricks himself does. The search for the past takes us through the war in Italy in 1944, a passionate love that seems to hold out hope, the great days of idealistic work in the 1960s and finally – unforgettably – back into the trenches of the Western Front. This moving novel casts a long, baleful light over the century we have left behind but may never fully understand. Daring, ambitious and in the end profoundly moving, this is Faulks’s most remarkable book yet. I’ve never found one of his to have lived up to Birdsong. Maybe our expectations are too high? Always a worry to read a new book by an author whose work you’ve loved. Usually unfounded but not for me in this case. It’s so disappointing when this happens with a favourite writer. I had the same with Joanna Trollope. Perhaps it’s inevitable when writers are under pressure from publishers and readers to produce and perform. I enjoyed the three war based novels he wrote but this was just lacking something for me. Another one disappointed by his more recent books…! Thanks for sharing your thoughts with us. It won’t stop me looking for this book as I do like this author. I hope I will not be disappointed. I hope you do enjoy it – do let me know. Thanks for commenting.